At every show I hear artists talking, " This is the best/worst show ever. I will/won't be back for sure." Both conversations happen at the same show. Why the difference in sales? Expectations are different. The new artist is happy just to meet expenses. While the experienced artists/business person is disappointed if they don't sell out by noon. Yes, the weather has an affect on attendance and local and national economical changes have an affect too. Shows booked too close together can have an impact on your sales. Artists may blame the show promoter for poor sales. The promoters respond that the artists need to actively sell their bears. However, the idea of being a "salesperson" may conjure up visions of a cigar-chewing, back-slapping, good ol' boy clad in a plaid suit. Maybe that is a little overboard but the idea of "selling" at shows turns most artists' knees to jelly. Without being a "hard sell" you can create a buying atmosphere in the same way the successful retail stores do. A show is just like a shopping mall. You expect the manager (show promoter) to provide a safe, easy access location. You expect the store owner to display the merchandise in an appealing way with friendly, helpful sales staff. In short the store's atmosphere creates the need to own. That is what American merchandising is all about - the emotional need to own, to take part in the image created by the product/store. The show promoters have done their job by advertising to bring collectors and would-be collectors into the show. It is your job as the vendor/artist to create an atmosphere that makes the collectors need to own your bear. "SO HOW DO I CREATE A TEDDY BEAR BUYING ATMOSPHERE?" you ask. Start with your display. Does it fit your product line or are you confusing the buyer? I'll use stores as examples to describe what I mean. Would you be willing to pay the high prices of a 5th Avenue dress shop if the merchandise was displayed on overstocked, slightly messy racks like K-Mart? Nothing against K-Mart, they do an excellent job of creating a bargain atmosphere by allowing that type of display. Both stores have an atmosphere that creates certain expectations in the customer. If your bear display (which draws customers to your table) does not match the facts (price and quality of the product) customers get confused and tend not to buy. 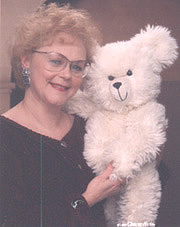 Collectors have a unique requirement of teddy bears that is not generally shared with other products. This inanimate object must "speak" to them and draw them into a fantasy world. To get them to interact with your bears, feed their fantasy world by posing the bears doing things that reflect real life; fishing, riding bikes, standing on their heads, taking pictures with an old camera, having a picnic, etc. This works with both dressed and undressed bears by adding a few props. Creating a theme to your display attracts attention and is much more interesting than just row after row of bears staing straight ahead. Lighting and a large "statement" or signature piece also draws attention to your table. Having the same display "look" at every show is important. Like the consistency in color and shape that allows you to recognize McDonald, Wendy's and Burger King signs long before you can actually read the lettering on the sign. Collectors who go to many shows, will recognize you r display long before they recognize your name. That recognition will mean repeat sales! Do a "dry run" setup at home to be sure everything fits within the table or booth space and you have all the tools needed to assemble it. Offer low cost items that compliment your theme such as clothing, jewelry or furniture. This allows a person with a small budget to share in the fantasy world too. Next, take a look at you and your helper in the mirror. Do you both look like you belong to that wonderful display you just designed? Choose a manor of dress that can carry the same theme without looking like you are in a costume. Wear the same colors at every show. Dress up and look successful. Be self-confident but not egotistical. Arrogance does not wear well in this industry. One artist told me she was so nervous at her first show that she spent most of the time in the rest room while her teenage daughters looked after her booth. She was afraid of having to "sell" her bears. (Images of wearing a plaid suit and smoking a cigar?) In a way she was right. "Hard sell" isn't always welcomed by people. At a show however, a little conversation between artist and collector is usually very welcomed. Collectors have taken the time, trouble and paid admission because they want to submerge themselves in the fantasy world of bears, including talking to the artists. Think about it, would you want to buy anything if the clerk in the mall store ignored you and read a book, chewed gum, gossiped with the other clerks, hid behind displays with folded arms, or no one was even at the store to handle your purchase? Unless you found something you just couldn't live without, most likely you would make your purchase from a store that would appreciate your business. Don't we owe our collectors the same courtesy we expect as customers, if not more? The artists that have learned to "talk bear" are the ones that draw a crowd. Although they may be selling, they don't think of it as "selling," just sharing their love of bears. If you think of these conversations with the collectors as, just conversations with new friends who share your love of bears, you will do just fine. If you think you must "sell" you will probably be too strong and the collector will quickly move away leaving your bears behind. Eye contact is very important in the first few seconds of opening your conversation. To make eye contact with the collector keep your display low and stand, don't sit, behind your table. (For a high display, stand in front or to the side of your table). Have a bear in your hands. Siting and working on a bears is fine if you are in front of your table and you talk to the customer. The collectors are your guest, don't wait for them to talk to you, it is your responsibility to speak first. Greet everyone that comes near your display and make your words count. Those first few words will complete the "buying atmosphere" you have worked so hard to create in your display and your dress. Be natural, smile and remember body language and tone of voice account for 80% of communication. Words only 20%. What you say should engage them in more than a simple yes or no answer. For example "What type of bears do you have in your collection?" "How long have you been collecting?" Not e these questions are about them, the collector. People love to talk about themselves. Don't ask questions that will get automatic answers about how hot/cold the weather is, or how are they enjoying the show etc. You will draw people to you like a magnet by being interested in them. When they stop or take a step towards you, you have their attention. Now you should be hanging on every word they say because they are telling you information you can use when the conversation turns to your bears. Hand them your bear as quickly as it will fit into the conversation. Your goal is to get them to hold your bear as soon as possible. Handling it gently, with respect for your work will add to it's perceived value. Pause, do not say anything that will distract their attention. Let the bear sell its self. Give the collector time to experience the emotional "need" factor. After a few moments if you feel a little "convincing" is necessary tell the collector the bears name and a short pl ayful story to help bring the bear to life for them. (Feed their teddy bear fantasy world.) Be quite, smile and just wait. That bear probably now has a new home. But, should the collector hand the bear back to you they generally will offer a reason. "That shade of green ribbon won't go in my blue bedroom." If appropriate use their reason to offer them another bear. Don't offer to change the ribbon, that would be "selling". You are just having a conversation, remember? "This shade of blue?" Repeat the quiet, smile and a new short story routine for every bear they hold. When you first try this, being quiet will be the hardest part. Somehow, not talking makes people feel they don't know what to do with their hands. Hold one of your bears. You will feel much calmer, and you will have a place for your hands. You will be able to stay quiet much longer, allowing time for your bear to "talk" to the collector and do the selling for you. Are you going to sell every person that holds your bear? Probably not. You will sell more bears by interacting with the collectors than hiding behind a tall display. If they choose to not buy and move away from your table thank them on behalf of your bear perhaps saying something playful, if you are comfortable with it, like "Buster really enjoyed the hug you gave him and he hopes you'll stop back" Then be sure to hand them your brochure or business card. Do not take any rejection personally. There are many reasons why people don't buy which have nothing to do with your bears or you. Keep smiling and quickly make eye contact with the next collector. If at all possible have someone travel with you that can not only watch your booth but, is willing to get involved with the collectors conversations. They do not need to know about bears. They just need to be willing to ask a few questions AND LISTEN. If you are having a bad day, leave your bears to your assistant and go for a walk, call home or spend your time in the rest room but, don't subject the collectors to anything negative. It will spoil their fantasy world and possible leave a bad impression of you. You are at the show to do business. Be professional at all times. Recently I had the opportunity to prove what I have written here works. I assisted one of our Spare Bear Parts customers at her first show. On the way to the show, she pressed concern about how to sell. We discussed the strategy of creating a buying atmosphere instead of "selling." All day long one or the other of us greeted passer-bys, as well as those pouring over the display. We made sure everyone was invited to hold/hug a bear or two. At the end of the day we had sold 14% of her displayed inventory. The adjoining table, who had similar size, price, quality and attractively displayed work, reported to us they had only sold one $15 necklace for the day. Although our neighbors were very nice people, all day they s tayed behind their table, mostly working on bears without initiating a conversation with any of the collectors. I wonder how many bears they could have sold had they created a teddy bear buying atmosphere. Say "I'll be glad to..." instead of "I'll have to.."
Don't use "integrity busters," line "I'll be honest with you, " "I'll level with you," " to tell you the truth," "to be perfectly frank," etc. They imply that you haven't been completely honest or frank to that point. And here's another point of view to consider, rather than "I disagree..." Translate "failures" into lessons." Turn "I'll try to..." statements into "I will..." statements.